Click here for Part Two of this post on mothers in sport. When my son was about five months old, I caught a violent stomach bug. It probably came home with him from daycare, which he had recently started after I returned to teaching part-time. That night, I vomited before bed, dozed, woke up to nurse my baby, vomited some more, dozed, woke up to nurse him, woke up to vomit again. And so on, until dawn. Where a day of solo parenting awaited me. As far as adversity while mothering goes, this brief bout of sickness was admittedly small potatoes! But that endless night of vomit and breast milk has a metaphorical resonance. It stands in for all of the exhaustion, the exasperation, the mental hurdles and the bodily fluids, that we endure as parents. There was a rhythm to enduring that night. A rhythm to getting through the discomfort. not past it but through it. Not unlike the rhythm of my contractions in a darkened hospital room at 3 am, where Sol and I labored alone together, abandoned to that ancient ritual by the hospital staff. I bounced goofily on a giant blue exercise ball, voice ululating* in harmony with the waves of pain until morning, and the doctor, finally arrived. Conscious in a way that I had never been before, conscious in a way that needed no evolutionary tree to persuade me, that, yes, I am an animal. Not unlike the rhythm of my feet hitting the pavement as I head out on a long run. That classic 4/4 time. In the catalogue of insufferable nicknames bestowed upon mother-athletes, Fanny Blankers-Koen’s ranks among the worst offenders. Born in 1918 in a village in Utrecht, the young Francina (“Fanny”) Koen quickly showed an aptitude for multiple sports, from swimming to skating. As a teenager, however, she was encouraged to focus on running, an area where she could make her mark as a Dutch athlete. The 1940 Helsinki games were supposed to be hers, a showcase for the then 22-year-old runner, who had set a world record for the 100-yard dash two years prior. Alas, the Second World War intervened. International sports competitions were suspended. So, in the meantime, as the Nazis occupied her country, she married her coach Jan Blankers, gave birth to son Jantke and daughter Fanneke, and continued to break world records (six in total from 1942-44). Blankers-Koen with husband and two children. Instead, Blankers-Koen went on to win four Gold medals—in the 100 meter, 200 meter, 80-meter hurdles, and 400-meter relay. She replicated the feat of her hero Jesse Owens, whom she had met at the Berlin Olympics 12 years earlier, and whose autograph remained a prized possession. Blankers-Koen’s stunning achievement was The Big Story of the 1948 Olympics. Her victory was an important one for female athletes, but its effect was amplified on the world stage, at that time of post-war grieving, healing, and rebuilding. Blankers-Koen endured these indignities and other, more elemental ones, including the Hongerwinter of 1944-5, which (as the name suggests) was a period of food scarcity and starvation in Holland as the war came to an end. After giving birth to Jan, she returned to training immediately. Although she took seven months off after her daughter Fanny was born four years later, she still worried about how training would affect her milk supply. 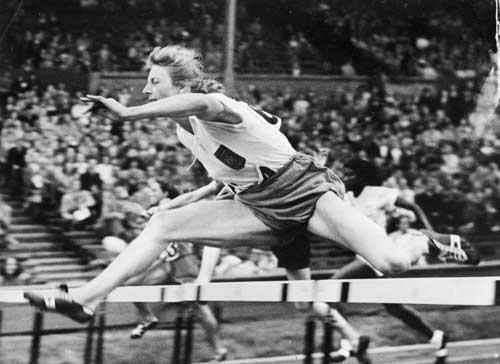 At the 1948 Games themselves, Blankers-Koen wanted to quit after medaling in her first two events. She was sick of the pressure and missed her children, who were staying with their grandparents in Holland. But the cry helped, and she went on to excel in her final two competitions. The endurance tests have continued after her death in 2004, mainly in the form of an unflattering biography by Dutch sports journalist Kees Kooman. Among the accusations, her daughter remembers Blankers-Koen as an unloving mother, who allegedly “only enjoyed herself when she was being worshipped” and prioritized sport over her children. Since Kooman’s biography is unavailable in English translation, I hesitate to comment on his portrait of Blankers-Koen. I wonder, though, what could possibly be so scandalous about his revelation that Blankers-Koen was complex, contradictory, not the “ideal wife and mother,” modest to a fault, that mid-century media portrayed her to be. As if it were possible to be a living, breathing stereotype! As if it were possible to strive for the height of accomplishment in your field and not have a competitive bone in your body. As it were impossible to love your children fiercely while also being ambivalent about parenthood and its costs to your professional ambitions. We are living in the afterbirth of Blankers-Koen’s 1948 victory. Several decades before Serena Williams assumed her very public role as an elite athlete and mother, Blankers-Koen’s Olympic triumph captured the imagination of a war-weary globe. And almost incidentally, almost as an afterthought, it started this whole messy, 70-year-long conversation about age and motherhood in sports. Blankers-Koen crossing the finish line in the 200-meter event, 1948 (photo via Getty images). Like Blankers-Koen, Wilma Rudolph didn’t compete in distance events; she was all about speed. *** Even so: ‘endurance’ is an apt descriptor for Rudolph’s story: a series of struggles, personal, generational, that laid the foundation for those mere seconds of breathless flight. She quickly made up for lost time. In middle school, Rudolph discovered a love of basketball; by high school, she also showed talents as a sprinter. In her junior year, she started working with Coach Ed Temple at Tennessee State, and qualified, along with the rest of the team, for the 1956 Olympics in Melbourne. As part of the 400-meter relay team, Rudolph earned a bronze medal. But just as Blankers-Koen’s four gold medals became the breakout story of the 1948 London games, the 1960 Olympics, held in Rome, belonged to Rudolph. The 20-year-old Tennessee native would capture three gold medals, in the 100 meter, 200 meter, and 400-meter relay, respectively. With that victory, Rudolph became the first American woman to win three Gold medals in a single Olympiad. Back in the United States, she met entertainers like Harry Belafonte and Lena Horne, even President Kennedy; was feted with banquets and parades—including one in her segregated hometown of Clarksville, which, at Rudolph’s insistence, was an integrated event. Rudolph’s victory parade in Clarksville, Tennessee (1960). In A Spectacular Leap: Black Women Athletes in Twentieth-Century America, Jennifer Lansbury notes the silences in the American press around Rudolph’s race. This omission was also a striking contrast to European newspapers, where Rudolph’s blackness was on explicit, and explicitly sexualized, display. The Italians christened her la gazzella nera (the black gazelle); the French, la perle noire (the black pearl). Here’s another detail that got left out: when Rudolph, a college sophomore at Tennessee State, took home those three Olympic gold medals, she was also the mother of a two-year-old child. During a routine pre-season physical at the start of her senior year of high school, Rudolph discovered that she was pregnant. The father was long-time boyfriend Robert Eldridge. Their daughter Yolanda was born in June of 1958; Rudolph started college three months later. Rudolph’s parents and older sister agreed to take care of the baby while Rudolph attended classes and trained at Tennessee State, about an hour away. Like parachutist Tiny Broadwick, who left baby Verla with her grandmother so that she could go on tour at age 14, the 18-year-old Rudolph relied on a strong kinship network to continue achieving in her sport. The family’s support was not without its cost. In Rudolph’s patriarchal household, Eldridge was barred from entering the Rudolph home, and Rudolph’s father forbid the young couple from remaining together. Rudolph later recalled that her father “ruled with an iron hand,” and she dared not challenge him. Rudolph with her daughter in the early 1970s. After her Olympic win, and after a brief marriage to fellow runner Willie Ward, Rudolph did marry Eldridge (literally over her father’s dead body). They had three more children together, Djuanna (1964), Robert Jr. (1965) and Xurry (1971), before divorcing in the early 1980s. Both Blankers-Koen (deemed a washed-up older housewife) and Rudolph (a young mother whose pregnancy was erased from the public record) pushed up against the stereotypes and silences of their day. As Lansbury notes, by keeping silent about Rudolph’s teenage pregnancy, the press avoided pinning the stereotype of “the hypersexual black woman” on Rudolph. In other ways, though, Rudolph’s public image as an athlete was all about embracing stereotypes of white 1950s and ‘60s femininity. The team slogan of the Tennessee Tigerbelles, led by Coach Temple during Rudolph’s tenure, was “foxes, not oxes.” Lansbury explains that part of the campaign to win legitimacy for women’s running was to feminize, and sexualize, its participants. So, Rudolph wore lipstick and high heels. She gave genial, beauty-pageant-esque interviews. She assumed the expected roles of mother and teacher. Surely, that couldn’t have been the whole story. Especially because, according to Lansbury, Rudolph never quite felt at ease after her seven-year running career came to an end. Rudolph with her three older children in LA, circa 1968. The silences around Rudolph’s experiences as a mother-athlete in the mid-20th century clash with Serena Williams’ public openness at the start of the 21st. ***** Maybe part of this is just a generational shift, the social-media-fication of motherhood, celebrity, sport. But the gendered conventions that Rudolph navigated as an athlete seem exhausting, especially when coupled with the fraught terrain of 1960s racial tensions. As a young woman just coming into her own, Rudolph walked a tightrope of stern expectations and forbidding silences, in exchange for those fleeting moments of uninhibited freedom on the track. To insist that Rudolph’s pregnancy with Yolanda is an integral part of her Olympic story is not meant to stigmatize her. Rather, it’s to suggest that girls and young women need to hear those fuller stories, in all of their complexity. Because motherhood, at any age, does not have to be construed as a permanent foreclosure of possibility. It does not in itself serve as a death sentence to athletic promise, or to dreams of flight. As she grew older, Rudolph mentored future generations of African American runners, like six-time Olympic medalist Jackie Joyner-Kersee, who said that talking to Rudolph “was like talking to someone you knew for a lifetime.” She also created the Wilma Rudolph Foundation, a non-profit serving amateur athletes in underprivileged communities. Rudolph at the 1960 Olympics. **Smithsonian contends that Blankers-Koen was pregnant with a third child during the 1948 Olympics. I haven’t seen this corroborated by another source, though. ***As mentioned in Part Two, the Olympics did not even include a marathon event for women until 1984. *****I had really wanted to offer a more first-hand account of Rudolph’s experience of young motherhood, but was foiled in my attempts to track down her 1977 autobiography. The only library in the U.S. that had a copy and participates in interlibrary loan wouldn’t send it to my institution.